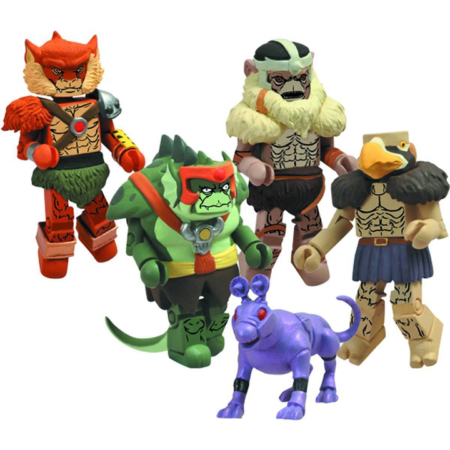 In 2002 New York-based sculpting and design company Art Asylum began producing stylized, lego-ish mini figures called Minimates. 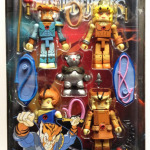 They are basic block-style figures that include snap-on parts and accessories to transform them in your favorite pop culture character. 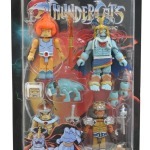 The Minimates started out as 3″ figures, but after Art Asylum teamed up with Diamond Select Toys in 2003, a slightly smaller, 2″ line of Marvel characters was announced and eventually the 2″ scale figures replaced the 3″ scale. Through the years many Minimates have been released for a ton of licenses. Star Trek, Kiss, Lord of the Rings, Back to the Future, the list goes on and on. 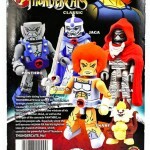 In 2012 the Ferocious Felines from Fundera ThunDera received the Minimates treatment, with fantastc results! 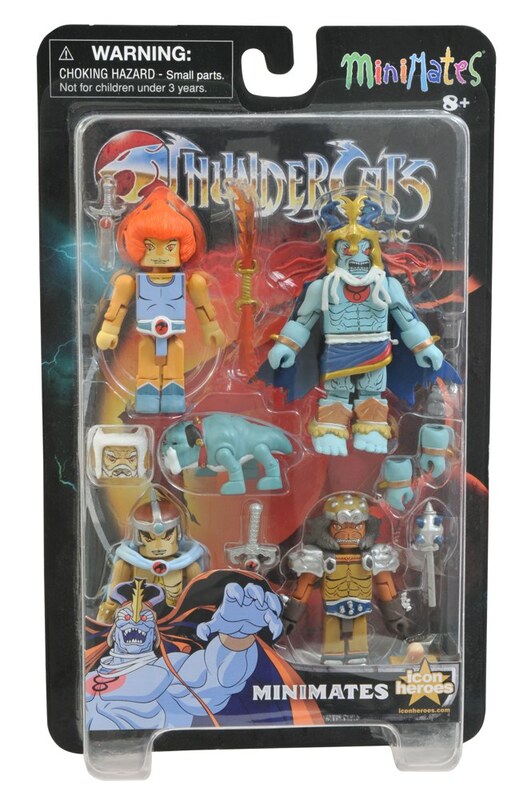 The Minimates ThunderCats line is the largest ThunderCats toy line since the vintage one, with 25 figures including previously unseen variants! 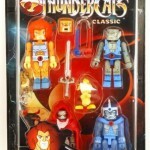 Lion-O – With alternate roaring head, Sword of Omens and Claw Shield with sleeping Sword of Omens! Jaga – astral form, featuring transparant blue parts! 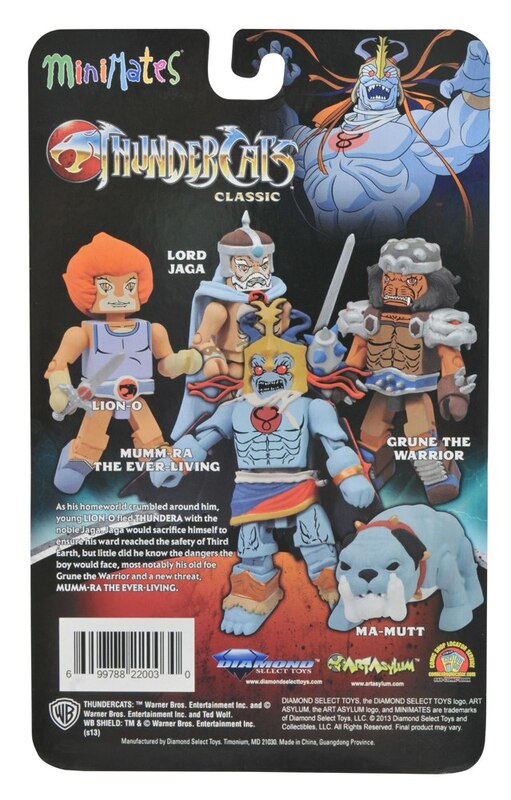 Mumm-Ra – decayed form, with classic LJN toys accurate staff! Slithe – With spiked mace! 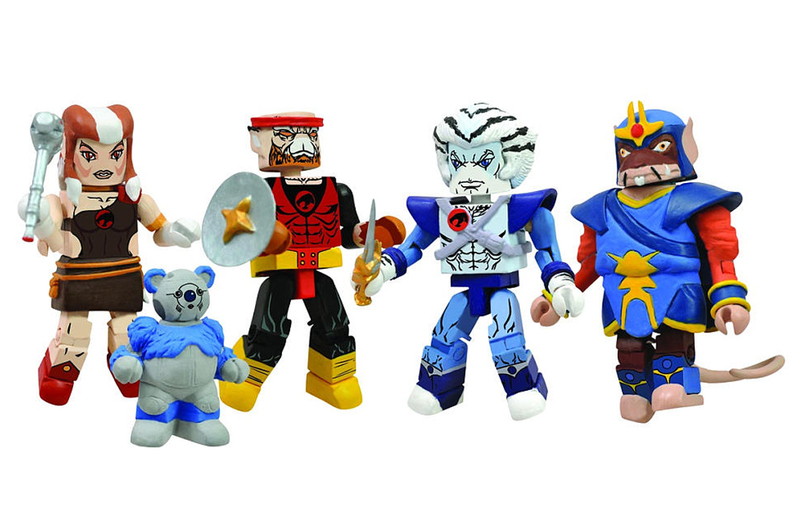 Monkian – With morning star and cartoon accurate shield! Vultureman – With ray pistol! 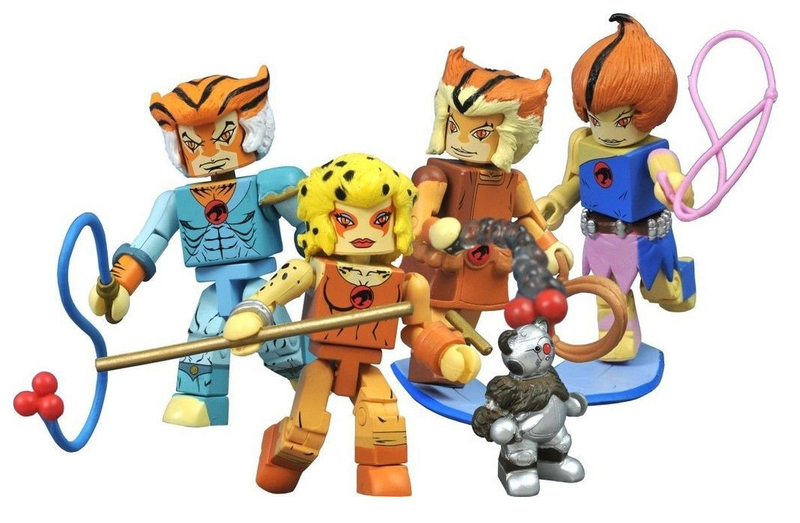 Cheetara – With bo staff! Tygra – With bolo whip! Wilykit – With spaceboard and lanyard! Wilykat – With spaceboard, lanyard and smoke pallets! Ro-Bear Bill – With knife, as seen in the episode “Berbils”! 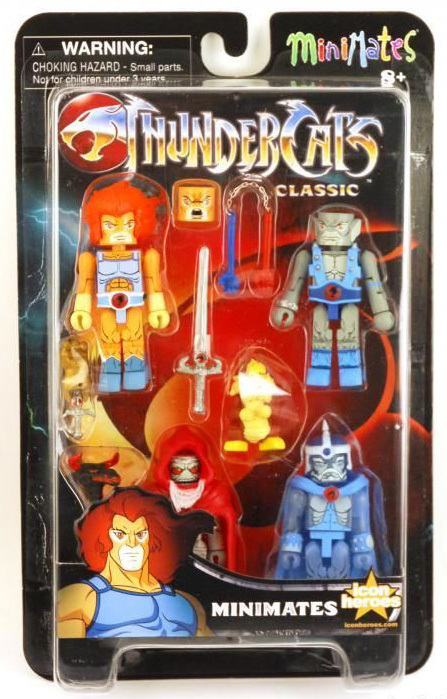 The fourth ThunderCats Minimates set was released in 2013 and was first available at the San Diego Comic Convention. 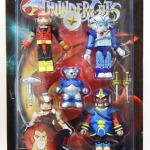 This set includes four regular Minimates figures and a non-poseable minifigure. 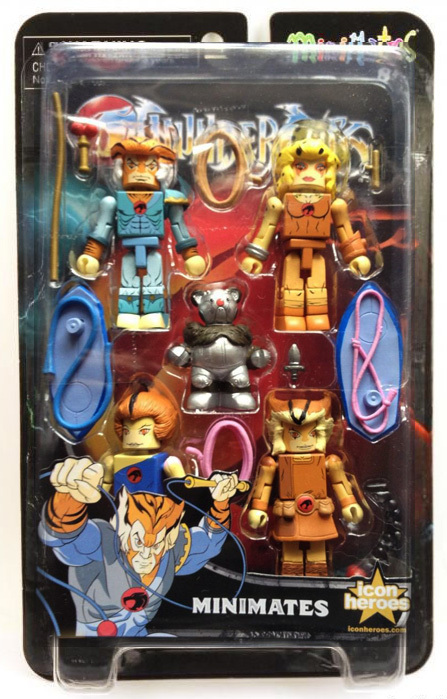 The figures are fully loaded and this set contains the most extra’s out of all sets. The focus lies on the different versions of the characters, which ofcourse include their signature weapons and accessories. And for the first time, transparant display bases were added! 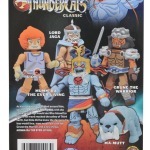 Also, as a bonus, a new version of Panthro’s armor and Lion-O’s belt were included. 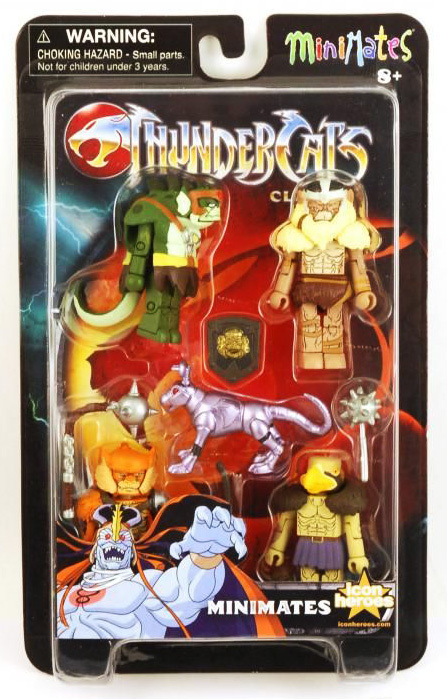 The quality of those two accessories from the very first set was sub-par in some cases, so if collectors had any problems with those, this set offers higher quality replacements! 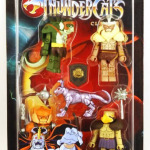 The figures in this set:Grune The Destroyer – With club and alternate torso with ThunderCats insignia! 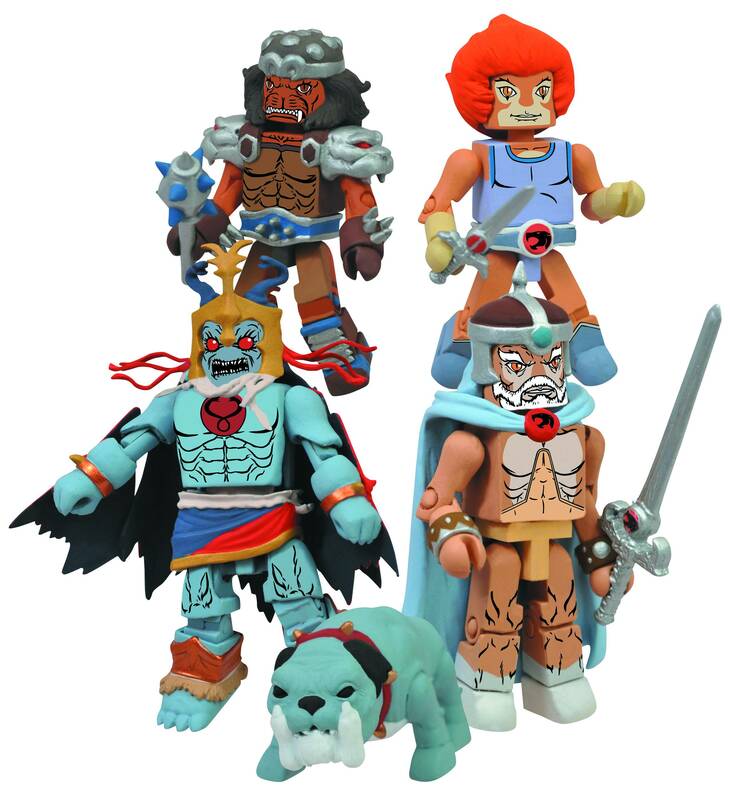 Mumm-Ra the Ever Living – With Sword of Plun-Darr and alternate forearms with added cape pieces! 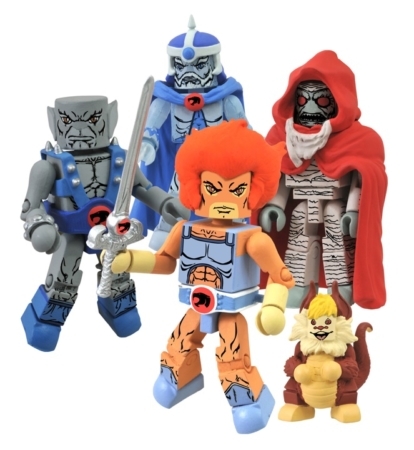 Young Lion-O – As seen in the very first ThunderCats episode “Exodus”, with sleeping Sword of Omens! 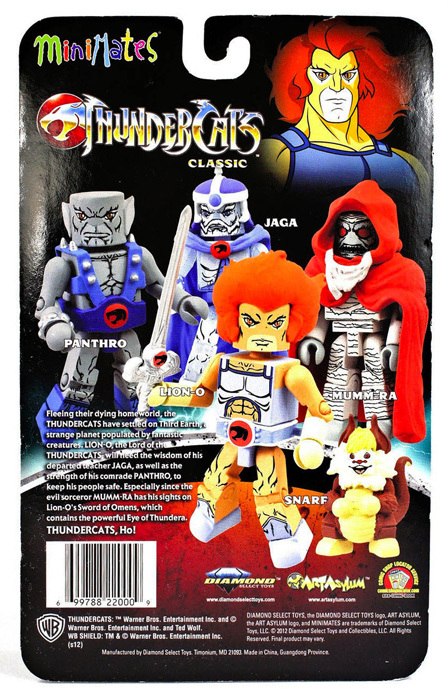 Jaga – With alternate young head, hair and Sword of Omens! Bengali – With Hammer of ThunDera! Lynx-O – With Light Shield! Ratar-O – With Rats Eyes-daggers!